Global solar panel production is expected to grow by almost a third this year which would be industry’s the best performance since 2011. 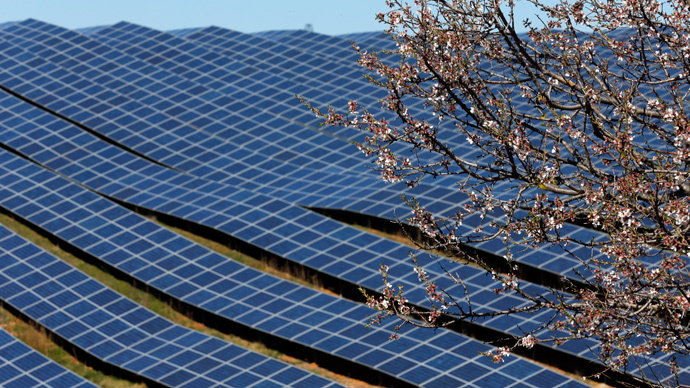 China will take the lead, producing more than 75 percent of the world’s panels. Japan will be the second largest producer and install up to 12.7 gigawatts of solar power in 2015, according to a Bloomberg survey published Tuesday. The country has been advocating greater use of renewable energy since the Fukushima nuclear disaster in 2011. Headed by Trina Solar Ltd., Chinese manufacturers expect to produce 55 gigawatts of panels this year, enough to power 11 million US homes and 31 percent more than last year. In November 2014 Chinese President Xi Jinping signed a deal with US President Barack Obama to increase the non-fossil fuel share of energy production to around 20 percent by 2030. To reach the target the Chinese government scaled up its plan for 2015 domestic solar installations by 5.8 gigawatts to 17.8 gigawatts. With the cost of production down 66 percent since 2010 the demand for solar panels started growing. In 2015 solar technology is able to compete on price with fossil fuels for the first time. Panel production has had a hard time since 2011 when US manufacturer Solyndra failed to compete with Chinese products. After $528 million in investment the company realized it couldn’t compete as Chinese capacity surged and prices fell. In 2007 and 2008 Chinese companies including JA Solar Holdings Co. and LDK Solar Co. raised almost $3 billion to expand production. This resulted in the industry’s excess capacity and oversupply in 2010. “It’s night and day how different the industry is now than it was three years ago,” Patrick Jobin, analyst at Credit Suisse Bloomberg in a phone interview. In 2015, NYSE Bloomberg Global Solar Energy Index of 132 companies gained 65 percent, outpacing the 3.4 percent gain for the S&P 500.